The all-new Chevrolet Volt may be the best solution today for moving to greener driving to reduce CO2 emissions and mitigate the effects of climate change. It’s an electric vehicle (EV) without the drawbacks. The many advantages of driving an EV include smooth, quiet motoring, minimal service requirements, and the feeling that you’re part of the solution and not the problem. The Chevrolet Volt, which debuted for 2011, was designed as an electric car with a range extender: The Voltec electric drive system. You could charge it up, drive about 35 miles, and then its small gasoline engine kicked in to generate electricity to keep the motor moving the car along. What’s most important, though, is that the new Volt offers an electric range of 53 miles. In a week with my Mosaic Black Metallic test car, I drove in silent, serene full-electric mode for all of my commuting (18 miles each way to work and home), and all of my normal errands. On only two occasions did I need the extended range. The combined range for gas and electric is 420 miles. When my Volt switched over to gasoline, the instrument panel indicated I had moved from battery power. I could hardly hear the engine when it engaged, and even when the battery was depleted, the car sometimes used it with power generated from braking. The electric motor puts out 149 horsepower (111 kW), and a strong 294 lb.-ft. of torque. The gas engine generates only 75 horsepower, but it’s meant to charge the car rather than drive it. Chevy claims an 8.4-second 0-60 time. I felt confident in it driving uphill on a winding road in the rain. The Volt comes in LT and Premier levels. My Premier tester flaunted attractive two-tone interior with tan inserts and silvery trim winding around the dash. The center screen is nicely rendered and there’s a jaunty blue plastic top on the “shift” knob. The rear seat now offers a center position, but there’s not a whole lot of legroom for that person. The hatchback is convenient, although it’s a high liftover. The Drive Mode switch lets you configure the Voltec system. Use Normal mode for maximum efficiency, Sport mode to take advantage of the bountiful electric motor torque, or Mountain mode for maximum power on steep upgrades. The fourth mode, Hold, lets you preserve your battery charge and use only gasoline. 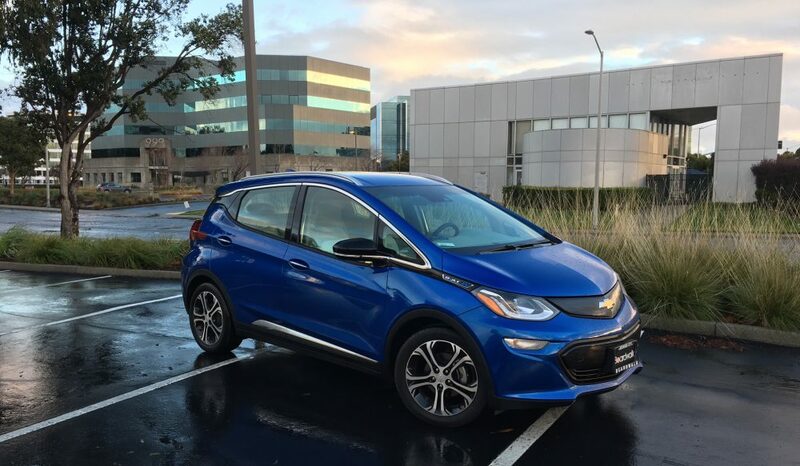 Regenerative braking is crucial for hybrids and EVs, but the Volt lets you prime the pump with a paddle on the left side of the steering wheel for “Regen on Demand.” Use it like a brake, while banking charge. With practice, you can drive almost without using the brake pedal at all. The LT starts at $34,820 and the Premier, with heated leather seats, a Bose stereo system, and more, starts at $39,270. My tester listed for $39,850. Various leasing options, plus some Federal and State rebates, can make these cars easier to drive home. While an all-electric car may be the ideal way to go, it’s not practical for everyone today. But if you want a compact car that’ll do pretty much everything and let you drive electric most of the time, the Volt is a great solution.